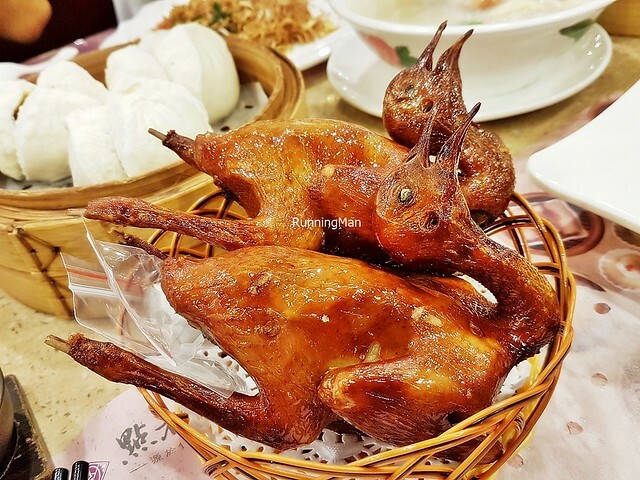 More Guangzhou Street Food that I've tried during other visits to Guangzhou, China, continuing from Part 1. 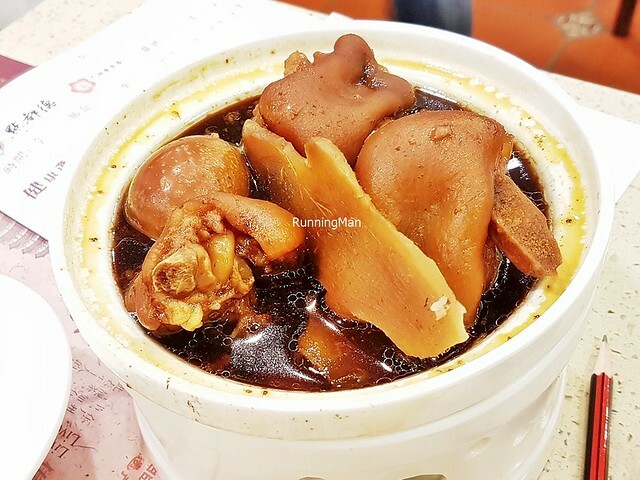 This list includes dishes not listed in Guangzhou Street Food - Part 1. 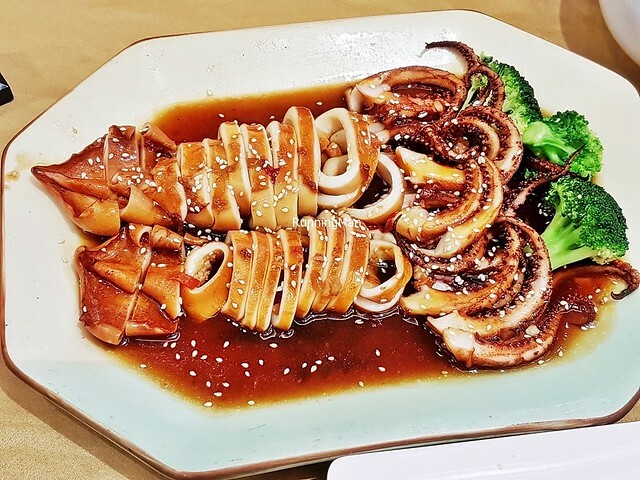 Cuisine is mostly Chinese Cantonese. 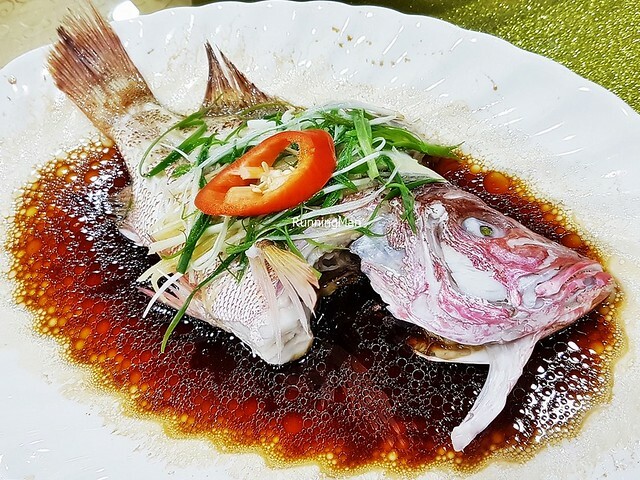 Bordered by the South China Sea, Guangzhou naturally has a lot of fresh seafood. 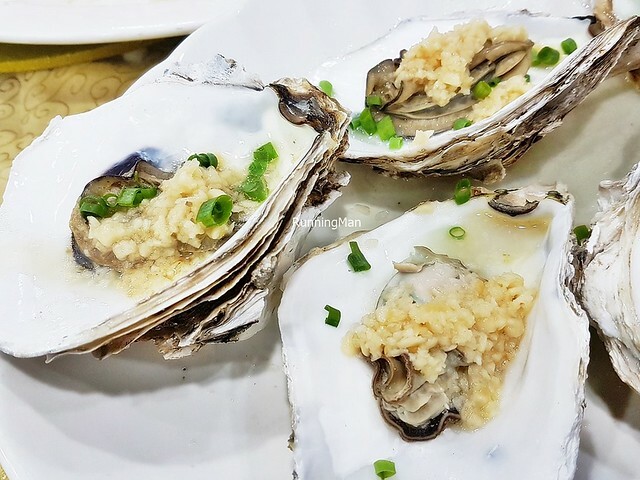 Among the most luxurious seafood dishes is the Abalone Steamed With Garlic, fresh meaty abalone, with a bouncy firm texture, lightly steamed with garlic and chili. The clean-tasting, sweet savoury flavour is so good. 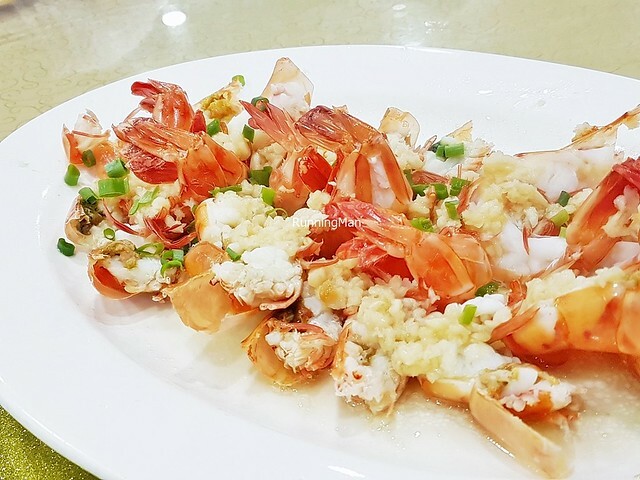 The wholesale seafood markets retail this exquisite seafood at relatively affordable prices. 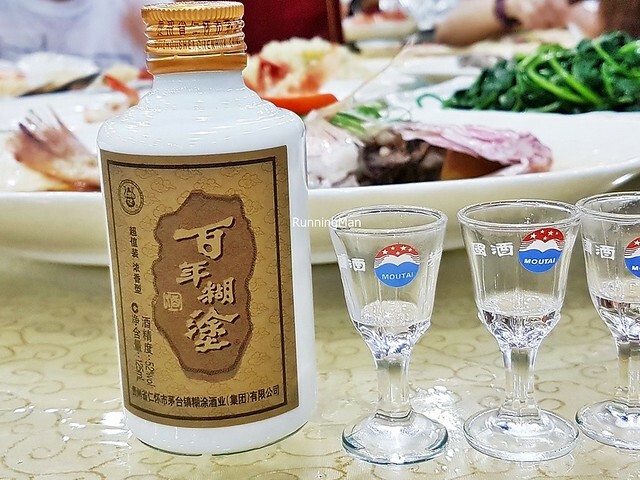 The Baijiu Bai Nian Hu Tu (Hundred Year Daze) is a type of Chinese rice wine, a clear liquid distilled from either fermented sorghum or glutinous rice. 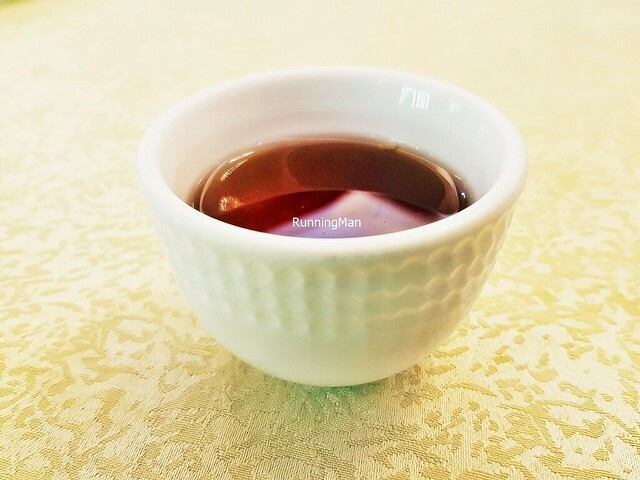 It has a high alcohol content, up to 52%, and may be served warm or room temperature, usually poured from a small ceramic bottle into tiny glass cups. 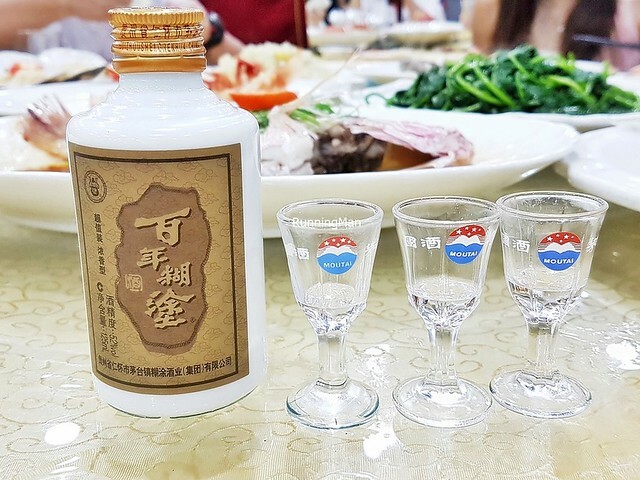 It has a strong liquour and grain taste, with a slight burning sensation. 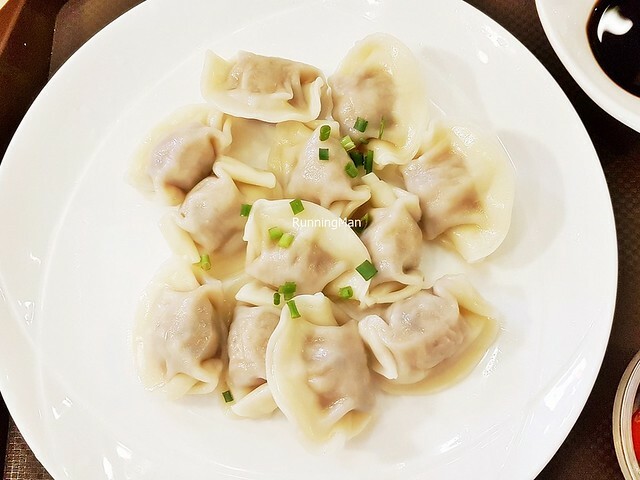 The Boiled Dumplings / Shui Jiao are a common street food, and I've usually eaten it for supper. 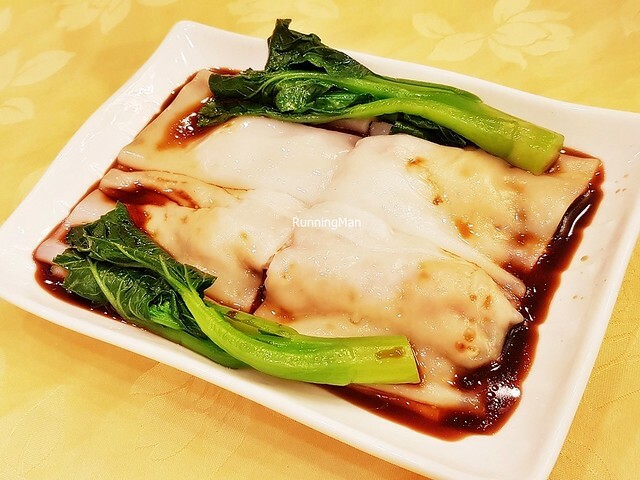 These usually feature a medium thick, translucent dumpling skin wrapper made from all-purpose flour and water. 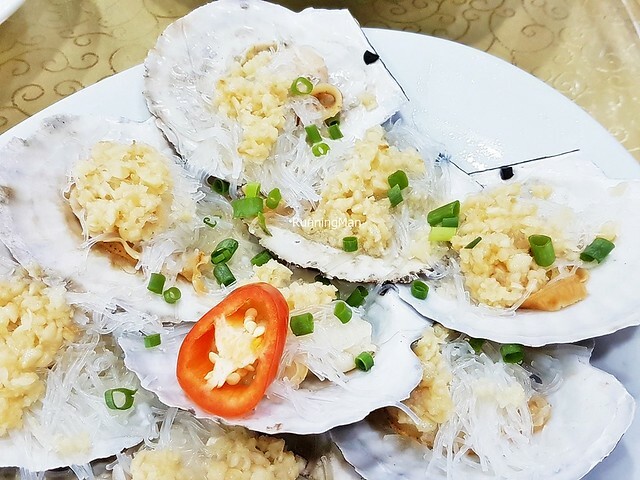 Fillings can differ widely, and usually include 1 to 2 of the following ingredients; pork, mutton, beef, chicken, fish, prawn / shrimp, napa cabbage, spring onions, leeks, celery, shiitake mushrooms, or garlic chives. They are boiled and served with a dipping sauce of black vinegar. Has a lovely savoury sweet flavour, with a small amount of delicious meat juices. 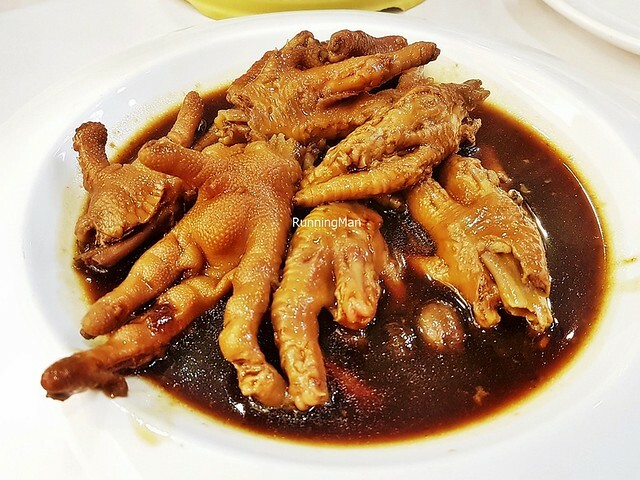 The Braised Phoenix Claw Chicken Feet is a dim sum classic dish, featuring chicken feet braised in Shaoxing rice wine, water, chicken stock, ginger, spring onions, salt, light soy sauce, sugar, garlic, oyster sauce, corn starch, pepper, black beans, bay leaves, cloves, star anise, cinnamon, and peanuts. 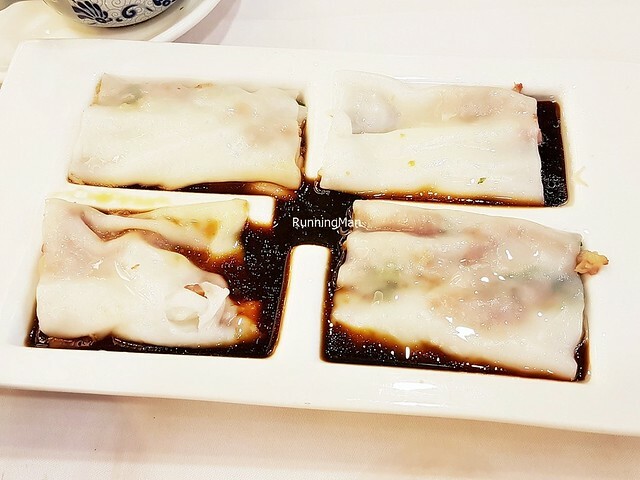 The meat has a tender, chewy, gelatinous texture, with a robust savoury salty flavour. 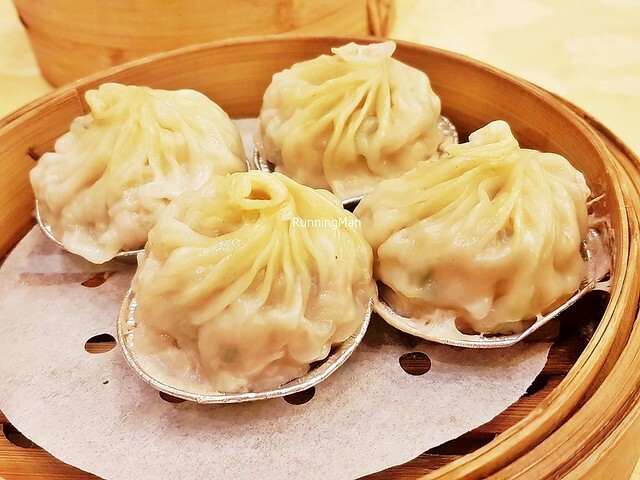 The Cantonese Xiao Long Bao differs widely from the usual version. 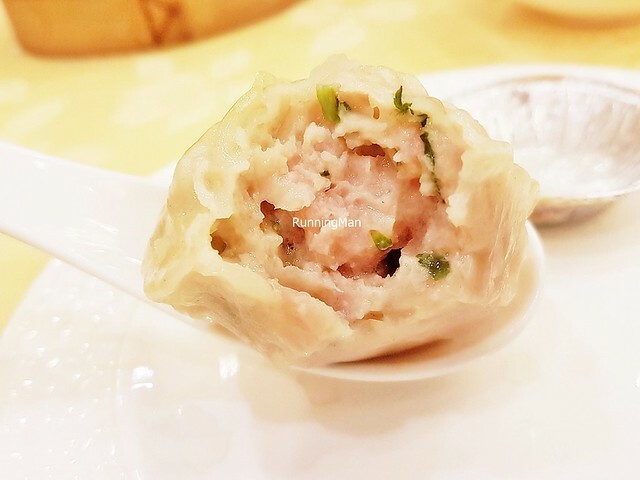 Consisting mostly of minced pork meat and some vegetables (spring onions, garlic chives, shittake mushrooms), it has a large, thin dumpling skin wrapper made from all-purpose flour and water. Lightly steamed, with a savoury sweet salty flavour, this more closely resembles a meat ball in presentation. 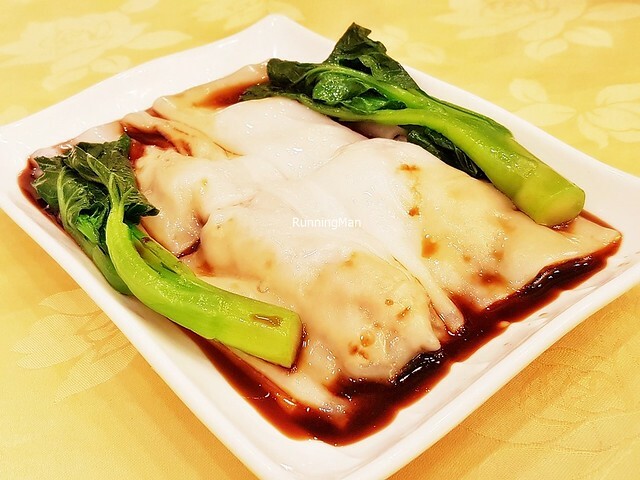 While still moist in texture, it usually has less meat juices within. 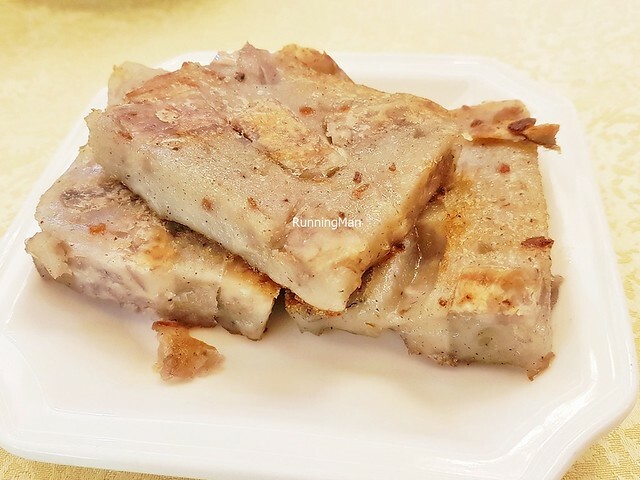 The Carrot Cake / Luo Bo Gao is made from mashed daikon radish, plain rice flour, dried shrimp, dried shiitake mushrooms, dried Chinese pork sausage / lap cheong, and Jinhua ham. 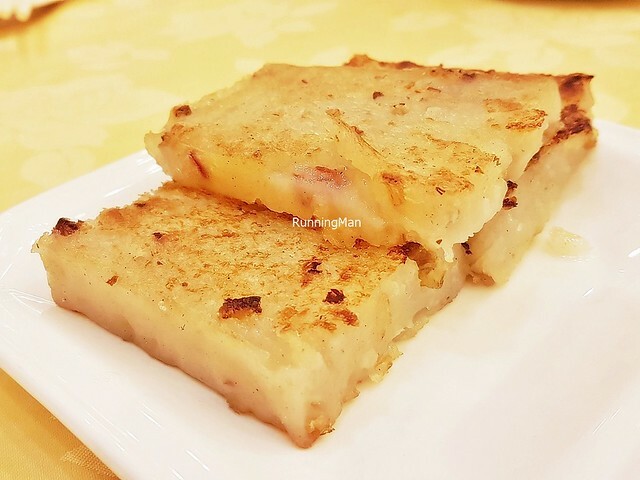 It's pan-fried till the exterior is crisp and golden-brown, but the interior remains soft and moist, with a bold savoury sweet salty flavour. 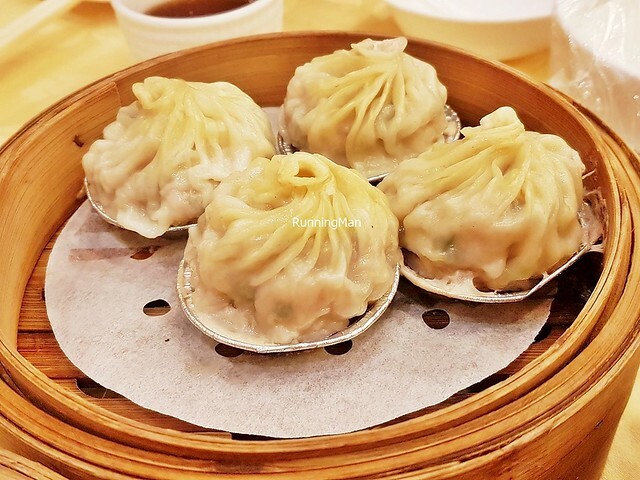 Usually served as part of a dim sum meal. 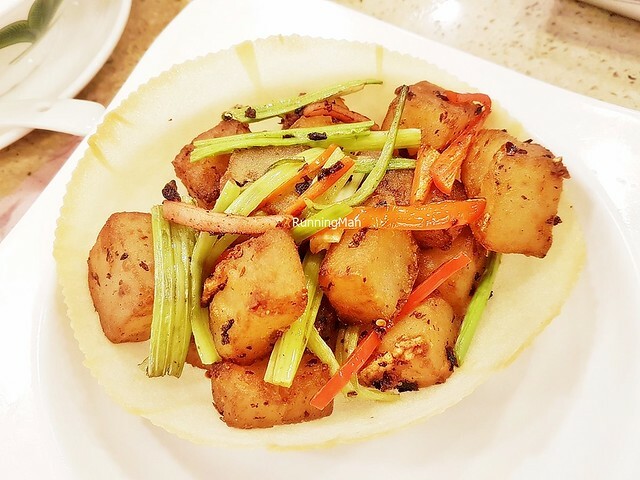 With the Carrot Cake XO / Luo Bo Gao XO, the additional ingredients of Shaoxing rice wine, light soy sauce, sugar, and garlic chives are added, giving this a much brighter, robust flavour. 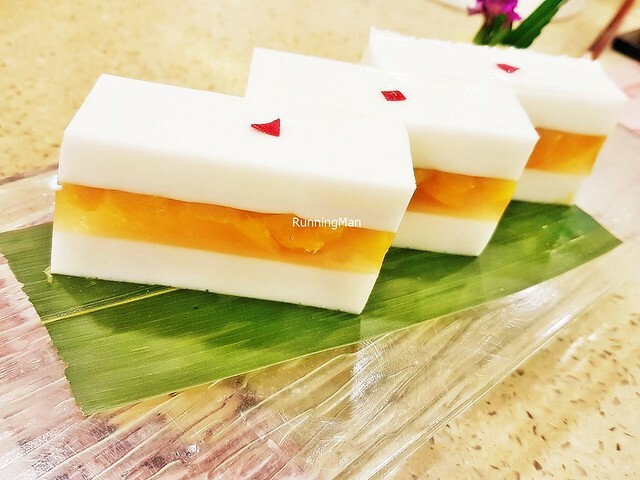 The Coconut Mango Cake features a layer of fresh sweet mango pudding, studded with bits of mango, sandwiched between layers of earthy sweet coconut pudding. 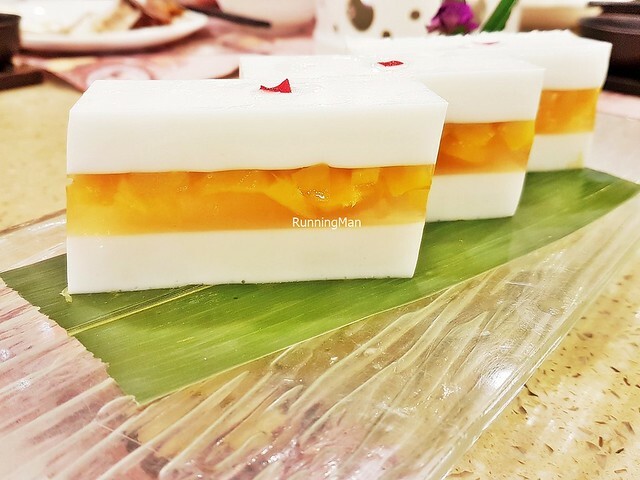 Cut into rectangular blocks to resemble a cake, this dessert has a wobbly soft texture and a fruity sweet taste. 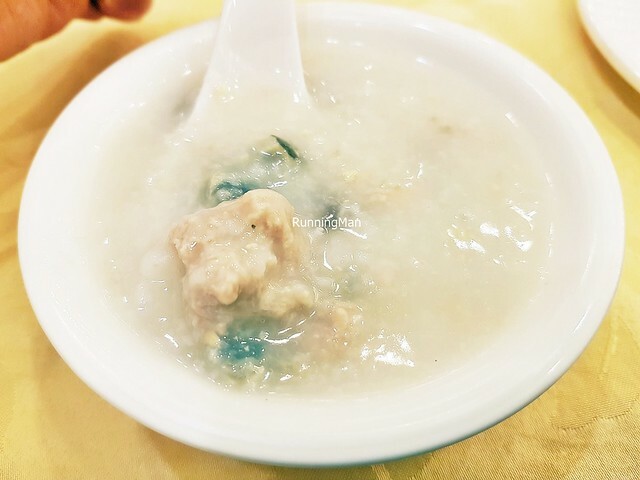 The Congee Pork & Century Egg is a popular breakfast dish, featuring slow stewed rice congee, enhanced with spring onions and ginger, garnished with sliced pork loin and preserved century egg. 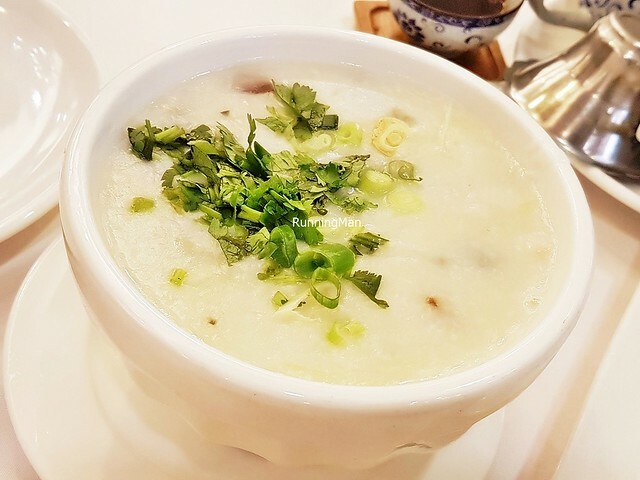 The delicate sweet savoury flavour of the congee and pork is layered with the smoky earthy spice flavour of the century egg. Sometimes eaten with a dash of light soy sauce, and the addition of crackers. 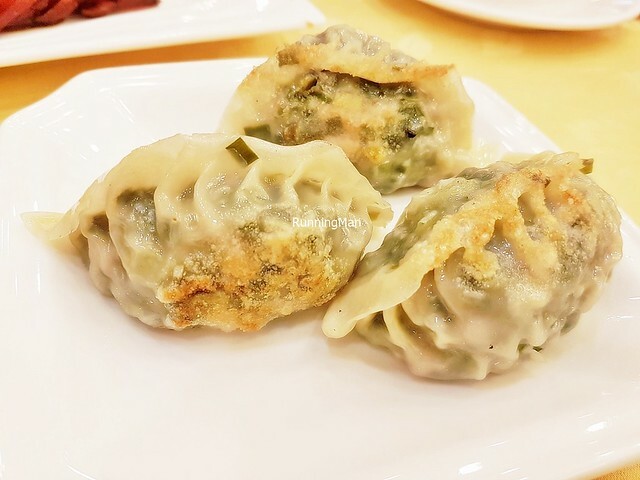 Pure Chinese comfort food. 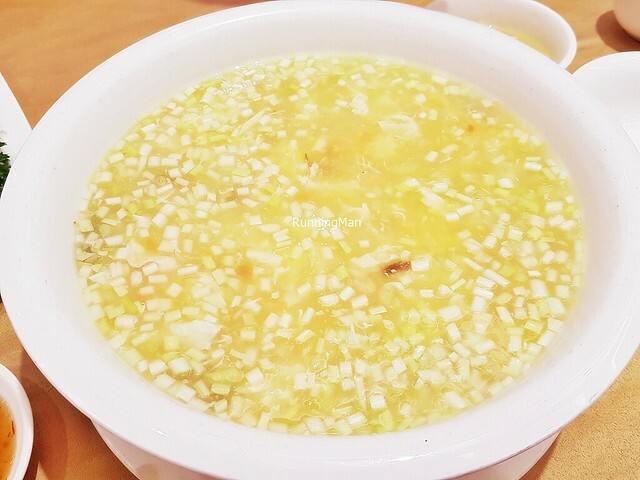 The double-boiled Corn Cucumber Pork Soup has a medium thick, sticky texture. 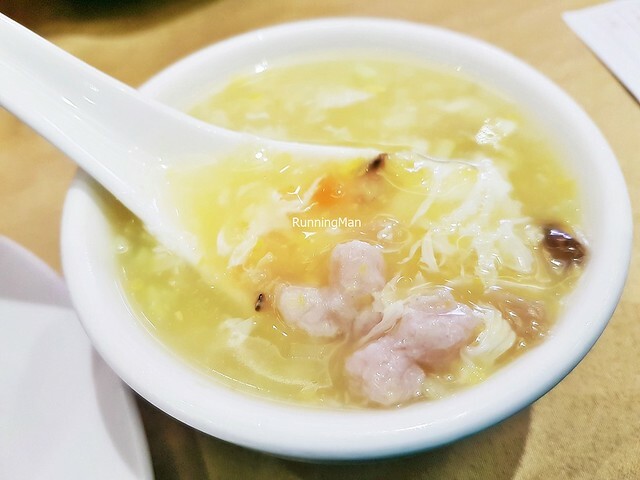 The bits of pork loin, corn kernels, cucumber, and egg lend a refreshing sweet savoury flavour to the warm soup / broth. Good as an appetizer, helps to open the palate nicely with its light, delicate flavours. 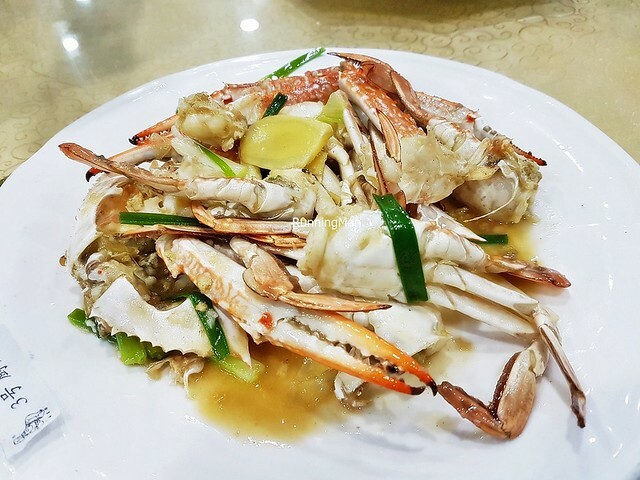 Love the Crab Blue Swimmer Steamed With Ginger & Spring Onions, which has blue swimmer crabs stir-fried with ginger, spring onions, and a light soy sauce. 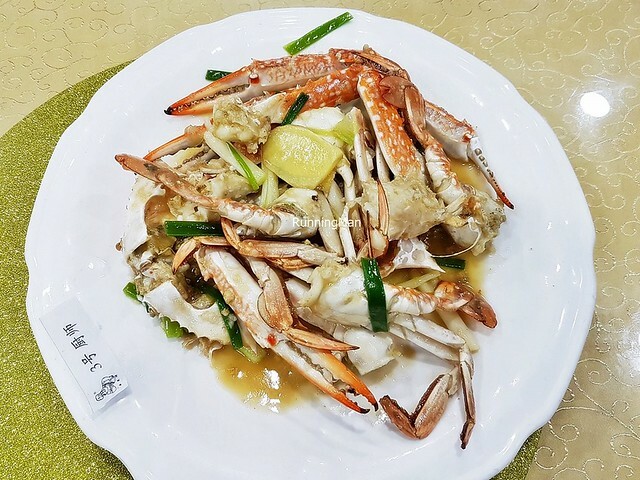 The fresh, meaty sweet crabs have their natural flavour complemented by the aromatics. 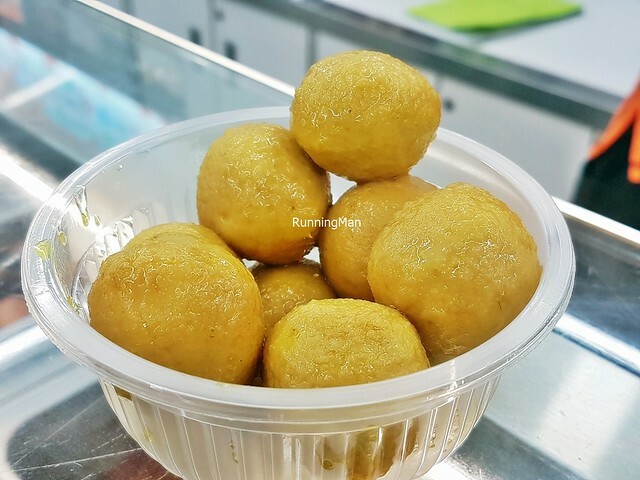 The Curry Fish Ball is a popular Cantonese street snack. 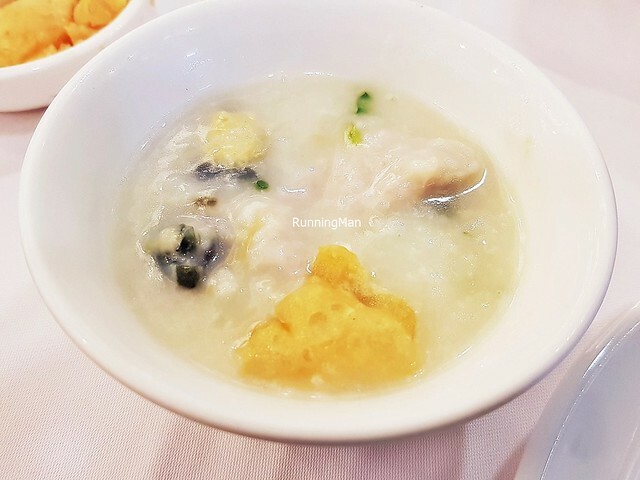 The fish balls are made from either Spanish mackerel fish or kingfish, along with corn starch, fish sauce, water, sugar, salt, and sesame oil. These are then boiled in a mild curry sauce, giving them a yellow colour hue, and a savoury sweet spice flavour. 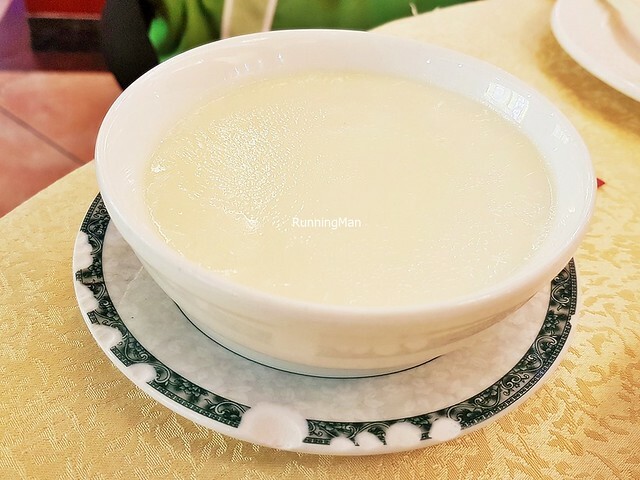 The Double Skin Milk Pudding is a classic Cantonese dessert which may be served warm or chilled. 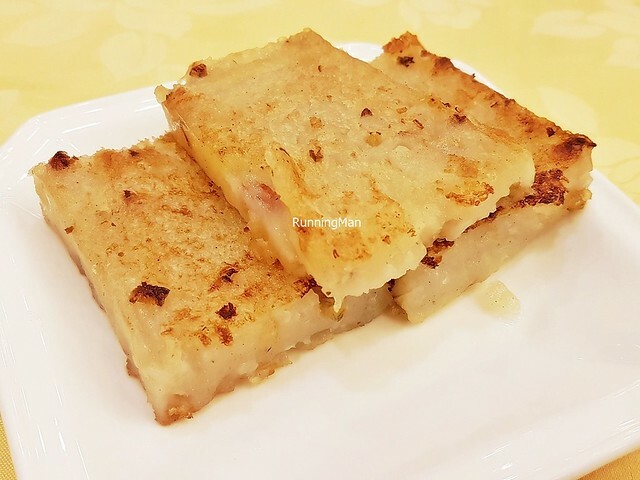 It's made with milk, egg whites, and sugar, and has a wobbly soft pudding texture with a sweet milky flavour. The first skin is formed during cooling of the boiled milk, and the second skin during cooling of the cooked pudding. 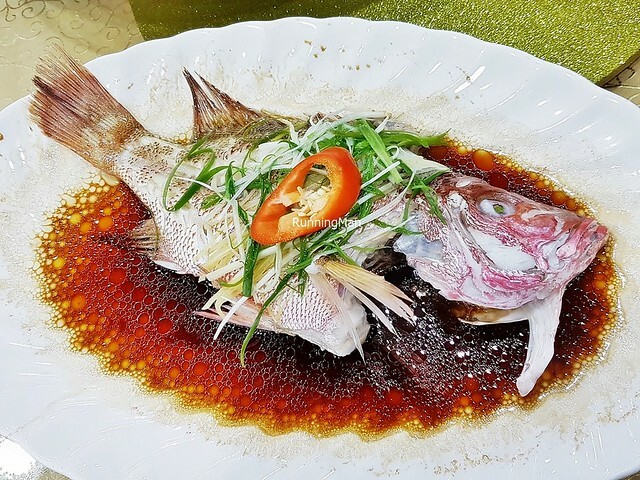 The Fish Red Snapper Steamed In Superior Soya Sauce features a whole, fresh red snapper fish, steamed with aromatics such as ginger, spring onions, and chili, served in a savoury salty sweet sauce / gravy of Shaoxing rice wine, light soy sauce, sugar, water, pepper, and sesame oil. 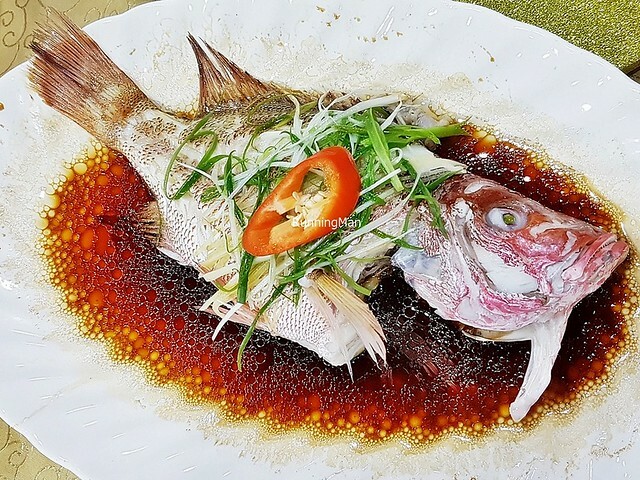 The key here is the fresh, clean-tasting fish, whose natural flavour is complemented by the robust sauce / gravy. 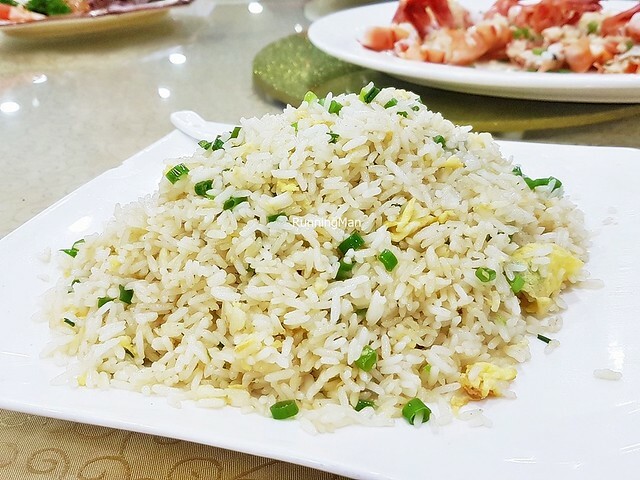 A simple Fried Rice Egg, featuring white rice stir-fried with egg, light soy sauce, spring onions, and sesame oil. Among the most basic staple dishes to accompany a meal. 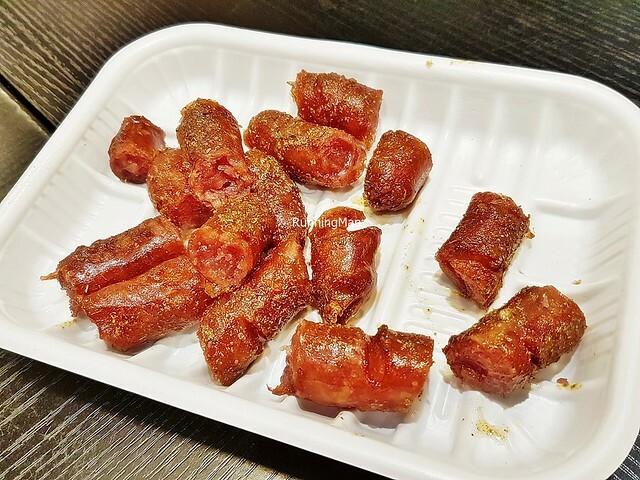 The Grilled Chinese Pork Sausage Lap Cheong With Cumin is a common street food usually served by the night markets. 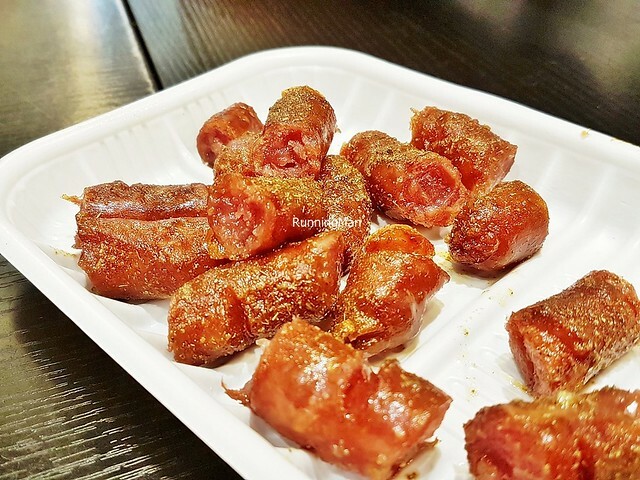 The dried Chinese pork sausage / lap cheong is grilled with a sprinkling of powdered cumin, creating a mix of salty savoury spice in the taste. Usually consumed with Chinese beer. 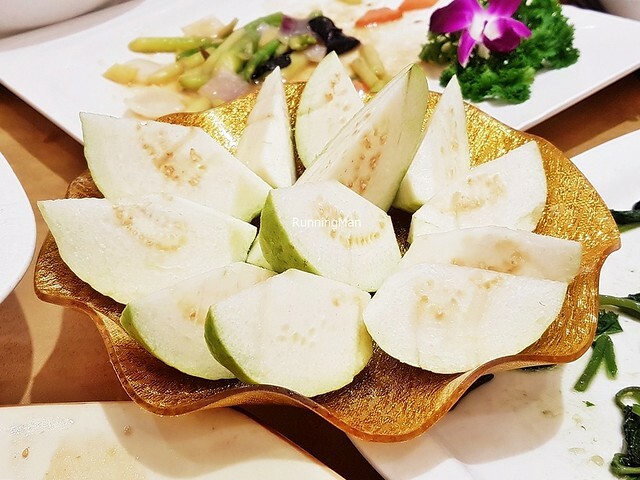 Fresh sliced Guava, served to round off and complete a sit-down Chinese dinner. 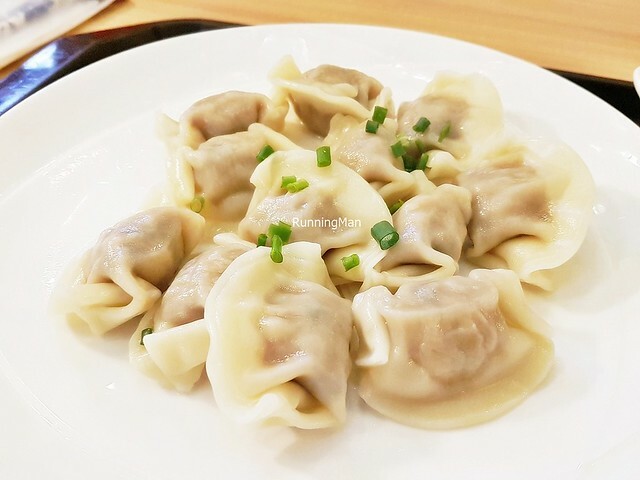 The Potsticker Dumpling / Guo Tie are a common street food, and I've usually eaten it for supper. 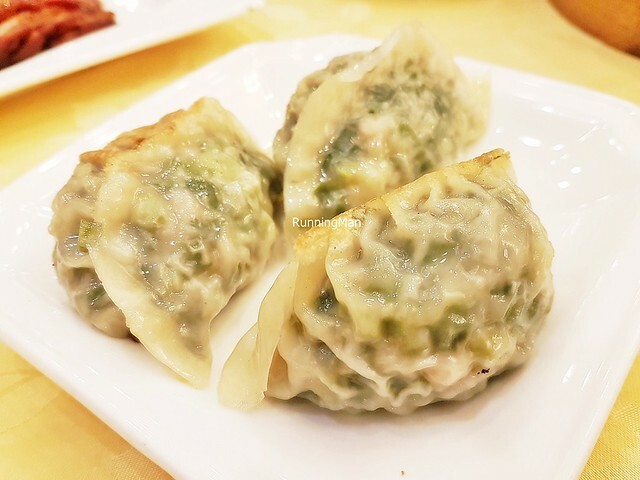 These usually feature a medium thick, translucent dumpling skin wrapper made from all-purpose flour and water. 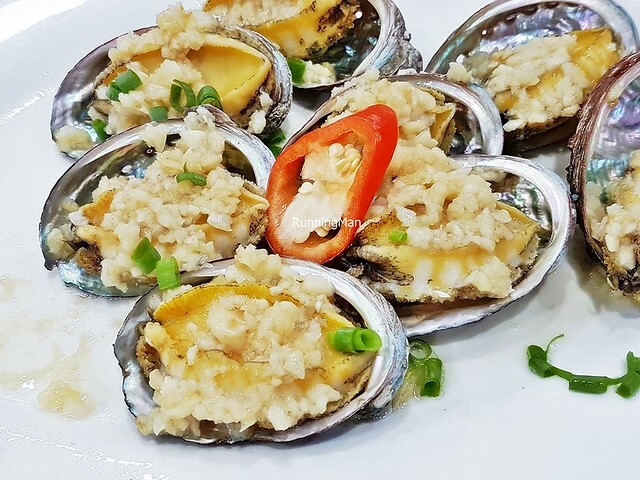 Fillings can differ widely, and usually include 1 to 2 of the following ingredients; pork, mutton, beef, chicken, fish, prawn / shrimp, napa cabbage, spring onions, leeks, celery, shiitake mushrooms, or garlic chives. 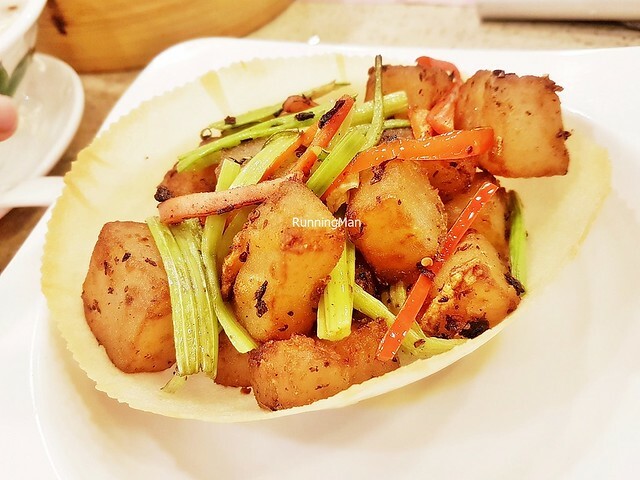 They are pan-fried till a crisp golden brown, and served with a dipping sauce of black vinegar. Has a lovely savoury sweet flavour, with a small amount of delicious meat juices. 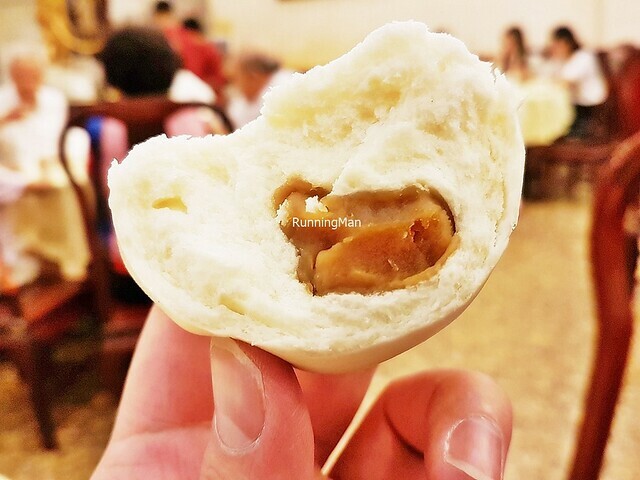 The Lotus Paste Bun / Ling Yong Bao has a creamy thick, sweet lotus seed paste, within a soft fluffy bun made from all-purpose flour, water, sugar, and yeast. 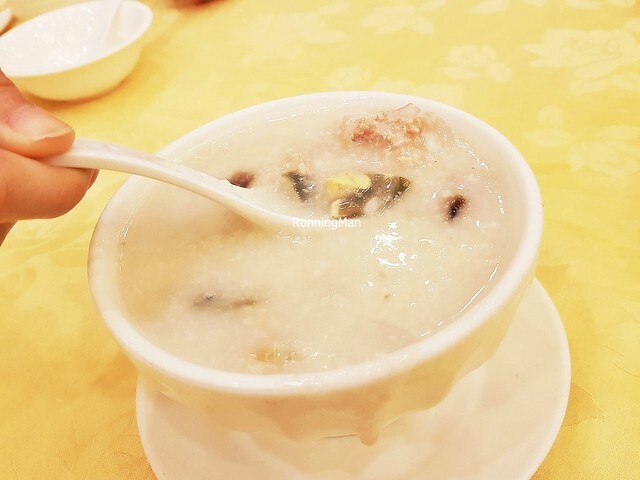 The paste is made by stewing dried lotus seeds in water, then mashing them with sugar, and finally straining it to get a smooth paste. Usually served as part of a dim sum meal. 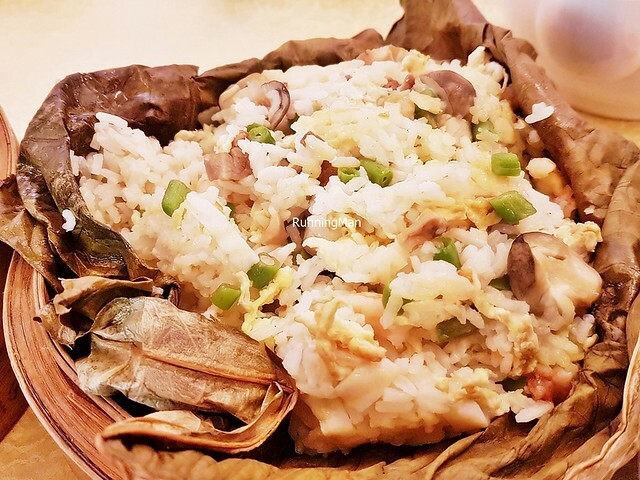 The Lotus Leaf Wild Rice is a traditional comfort dish, featuring white rice steamed in a lotus leaf, along with egg, spring onions, shiitake mushrooms, pork loin, and served in a wooden basket. Rather uncommon these days, mostly sold in restaurants. 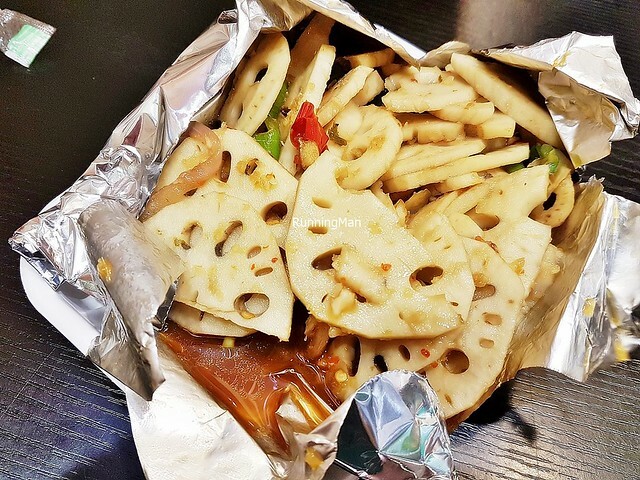 The Lotus Root Steamed With Chili has sliced lotus root, steamed along with water, light soy sauce, and sliced chili. 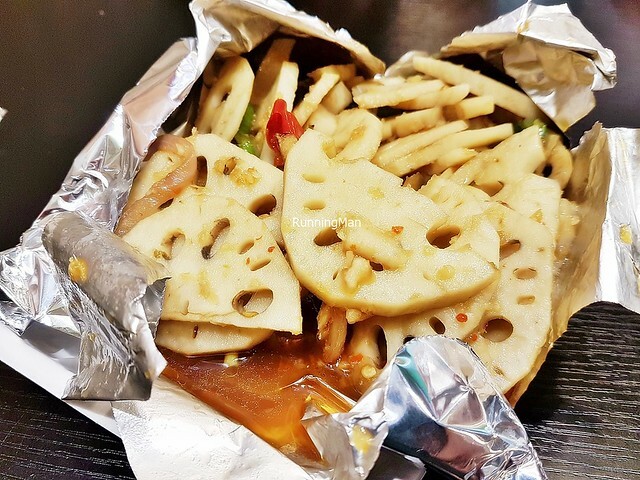 This locks in the flavour, making the lotus root take on a crunchy yet moist texture, with a light salty spicy flavour. Usually served as a bar snack, to accompany beer. 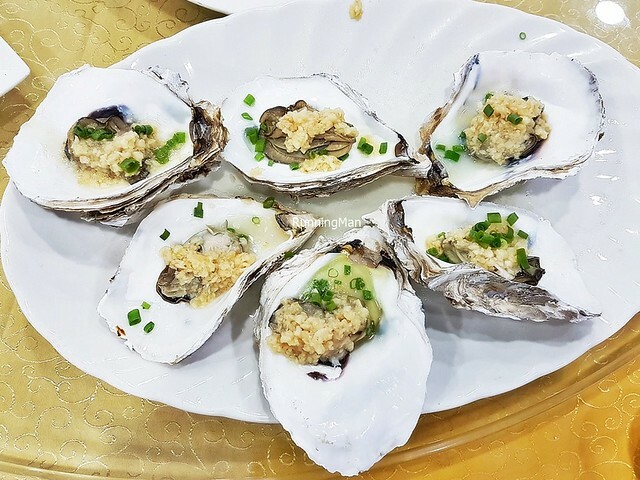 The Oysters Steamed With Garlic has fresh, meaty sweet oysters in their shells, lightly steamed with garlic and spring onions. So clean-tasting and delicious. 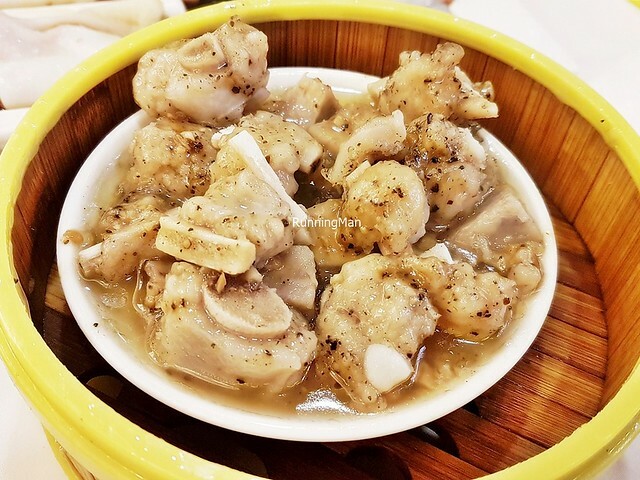 The Pig's Trotters In Vinegar Ginger Sauce has slow braised eggs and pig's trotters, with a good ratio of fat and lean meat, in a sharp sour gravy of salt, black vinegar, palm sugar, ginger, and sesame oil. 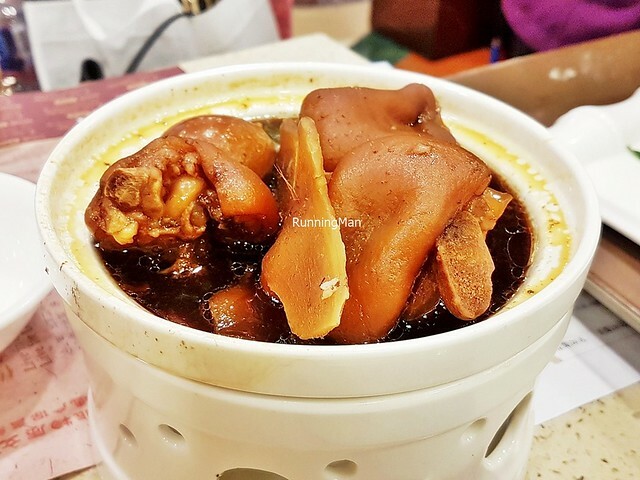 The pig trotters have a fatty, gelatinous, meaty texture, with meat that is so tender, pulling off the bone easily. Said to have medicinal benefits, this traditional confinement dish is often eaten by ladies who have just given birth. 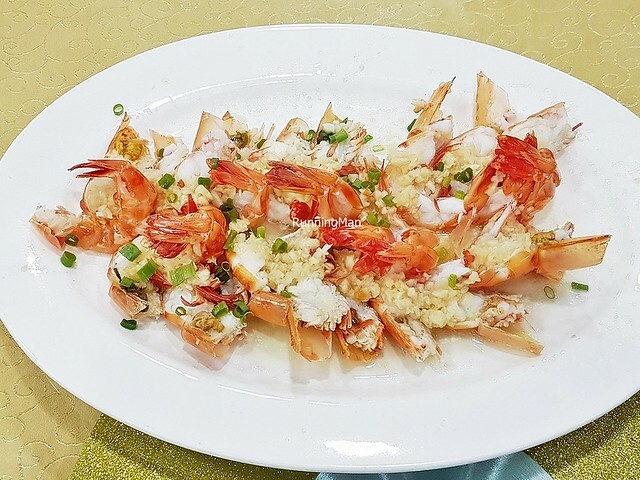 The Prawns Steamed With Garlic has fresh deshelled butterflied prawns / shrimp, simply steamed with garlic and spring onions. Nice sweet savoury flavours. 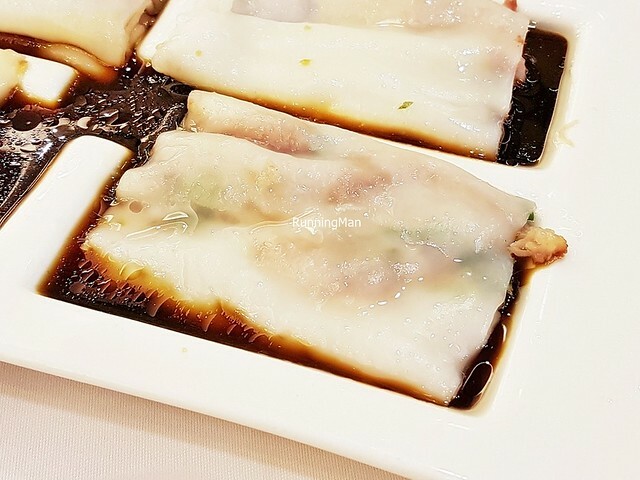 The Rice Noodle Rolls Roast Pork Loin / Char Siew Chee Cheong Fun are a popular Chinese Cantonese dish, featuring thin rice noodle rolls, stuffed with savoury sweet roast pork loin, in a salty savoury sauce / gravy of light soy sauce, dark soy sauce, oyster sauce, water, and shallots. 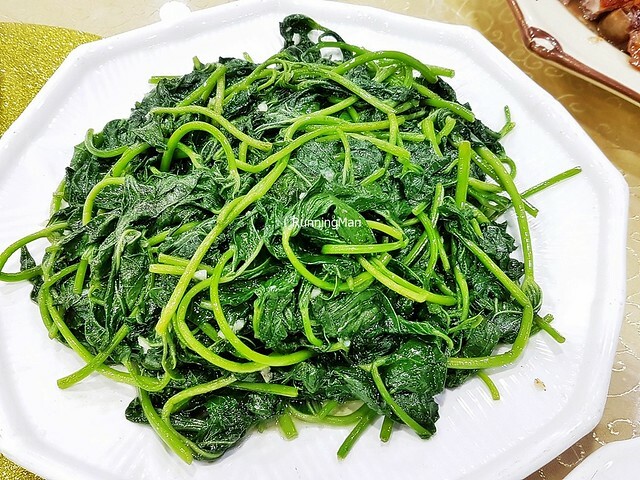 The dish is sometimes garnished with kai-lan / Chinese kale / Chinese broccoli, or spring onions. 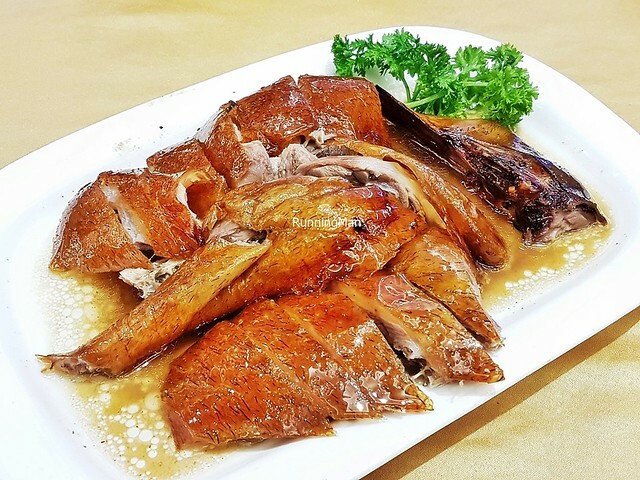 The Chinese Cantonese style Roast Goose is traditionally roasted in a charcoal oven at high heat. This results in a thin, crispy skin with sharp salty flavour, under which sits a thick layer of water-soluble and easily digestable goose fat. 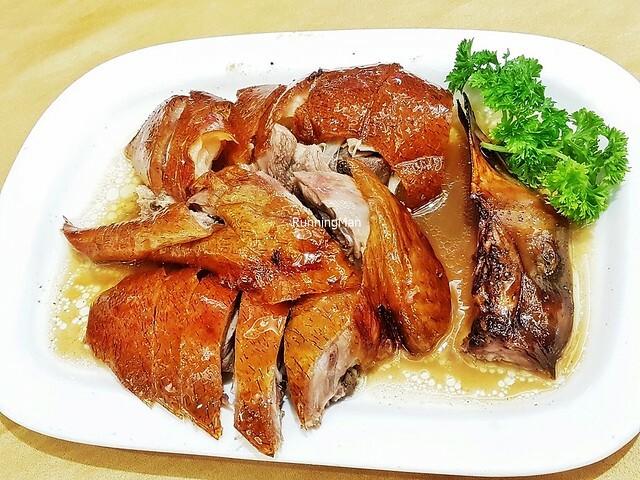 The goose meat is juicy and tender in texture, savoury sweet salty in flavour. A very popular dinner dish around here. 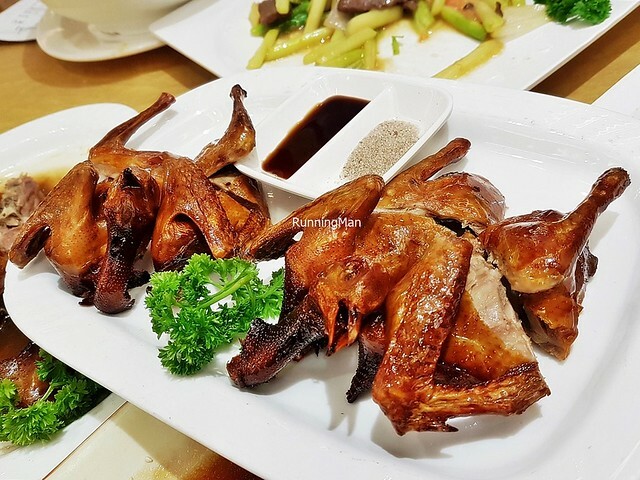 The Roast Pigeon is usually served deep-fried with plum salt, but is prepared by first braising in light soy sauce, Shaoxing rice wine, and star anise. 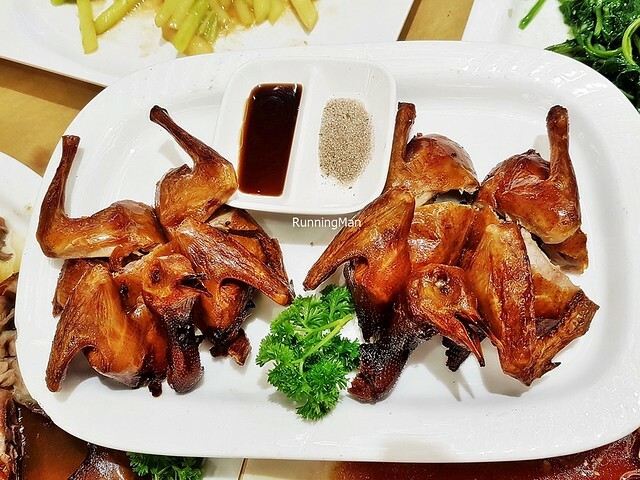 As these are squab, which are young domestic pigeons under 1 month old, the meat is usually tender and juicy, with a light savoury salty flavour. 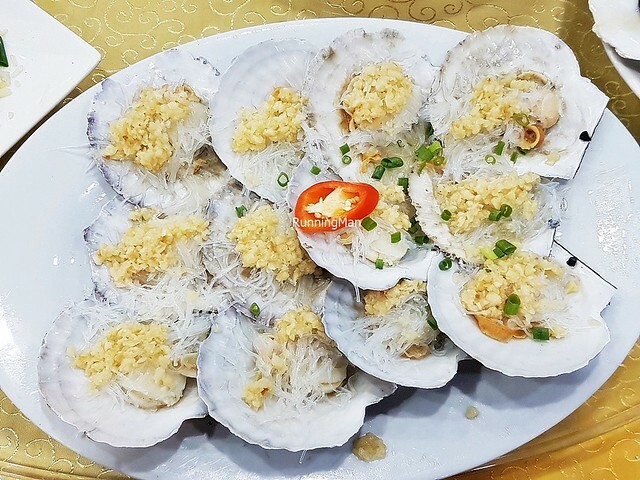 The Scallops Steamed With Garlic & Glass Vermicelli feature half-shell scallops, lightly steamed with garlic, spring onions, and glass vermicelli noodles. Clean-tasting and fresh, meaty sweet savoury in flavour, with a light chew to texture. 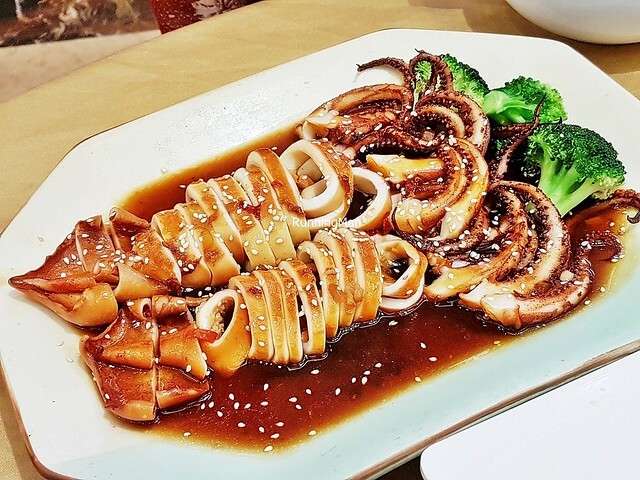 The Spicy Sweet Sauce Squid features a whole, fresh squid, bouncy chewy in texture, marinated and barbecued with a sweet and spicy sauce, then served in the same sauce, dressed with sesame seeds which lend a light crunch. 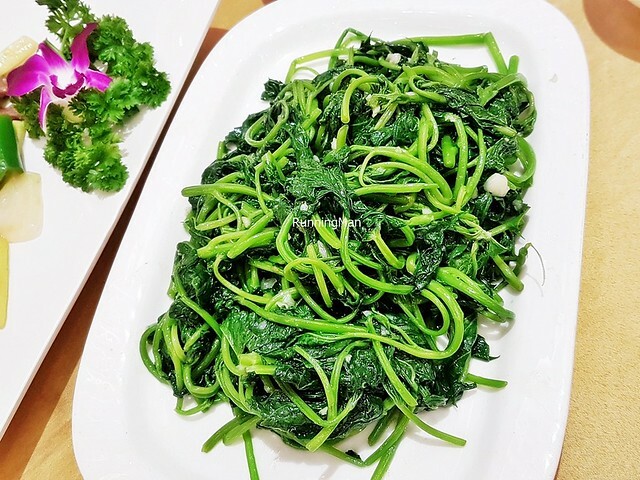 Florets of broccoli are added as a garnish. A straightforward, simple dish. 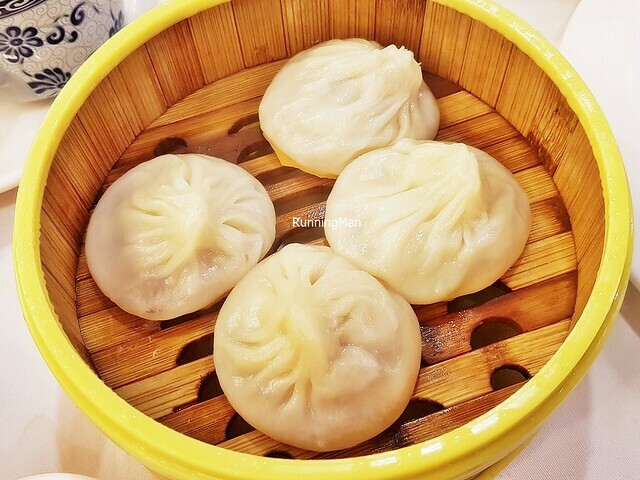 The Steamed Dumplings / Zheng Jiao are a common street food, and I've usually eaten it for breakfast. 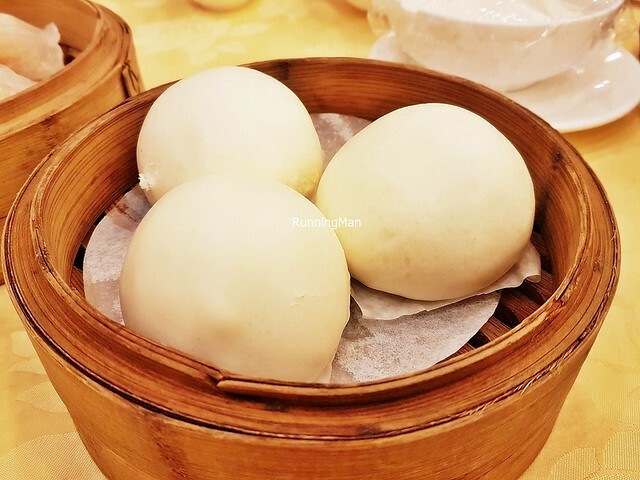 These usually feature a medium thick, translucent dumpling skin wrapper made from all-purpose flour and water. 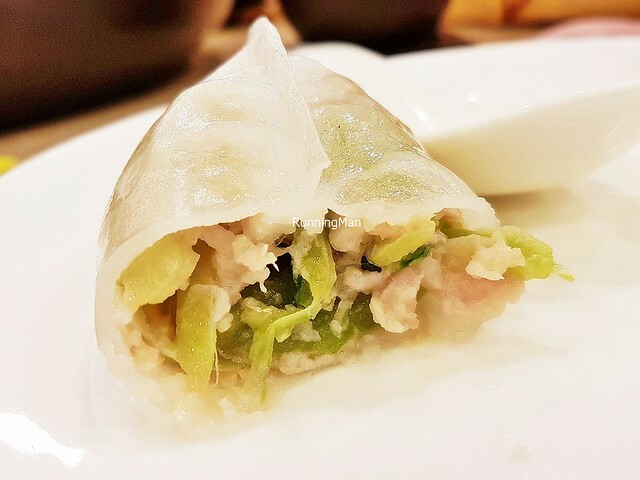 Fillings can differ widely, and usually include 1 to 2 of the following ingredients; pork, mutton, beef, chicken, fish, prawn / shrimp, napa cabbage, spring onions, leeks, celery, shiitake mushrooms, or garlic chives. 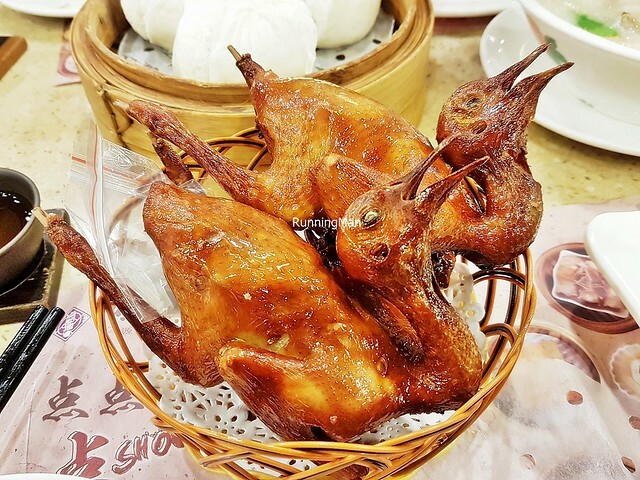 They are steamed and served in little wooden baskets, without any dipping sauce. Has a lovely savoury sweet flavour, with a small amount of delicious meat juices. 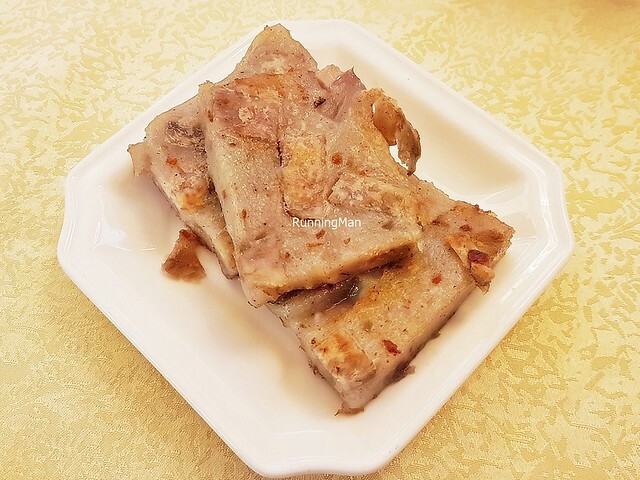 The Steamed Pork Ribs Black Pepper Sauce Style differs slightly from the usual dim sum classic, by coating the pork ribs in black pepper. 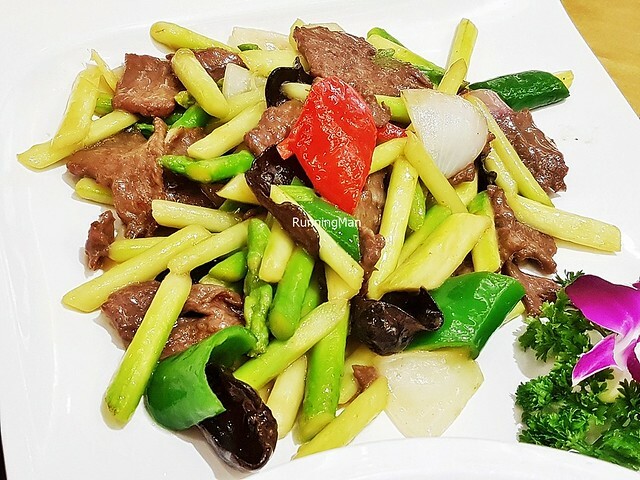 The Stir-Fried Bamboo Shoots With Beef feature tender slices of beef, with a soft, chewy texture and a nice savoury flavour. 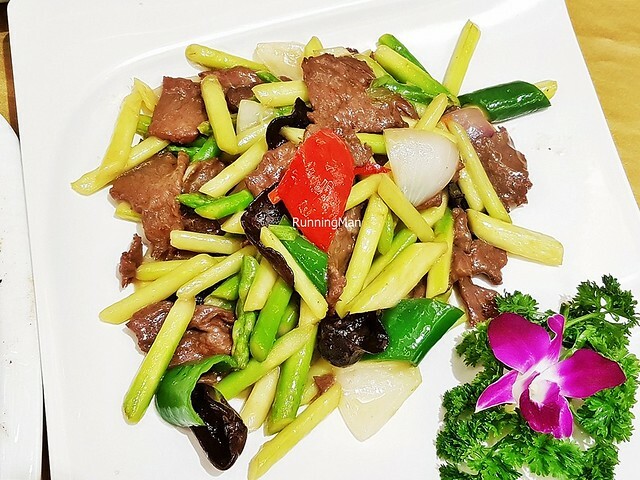 It's stir-fried with asparagus, young bamboo shoots, onions, green bell peppers / capsicum, red bell peppers / capsicum, and black fungus / cloud ear fungus, all of which lend a crunchy texture and a vegetal earthy sweet flavour. Freshness of the ingredients is key here, as the simplicity allows the natural flavours to shine through. 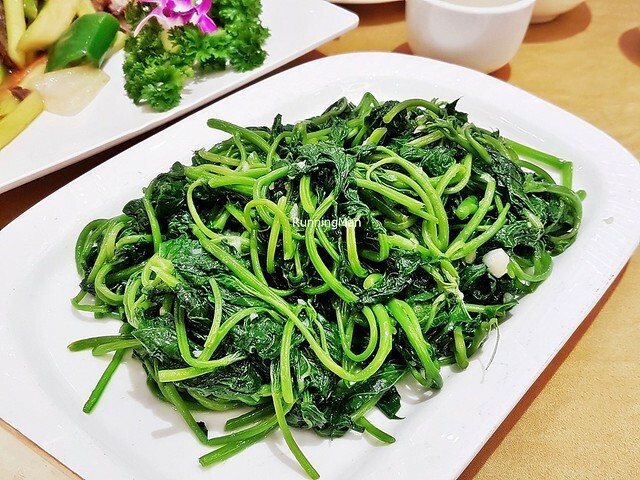 The Stir-Fried Sweet Potato Leaves With Garlic is a simple, straightforward dish, where fresh sweet potato leaves are stir-fried with garlic and salt. 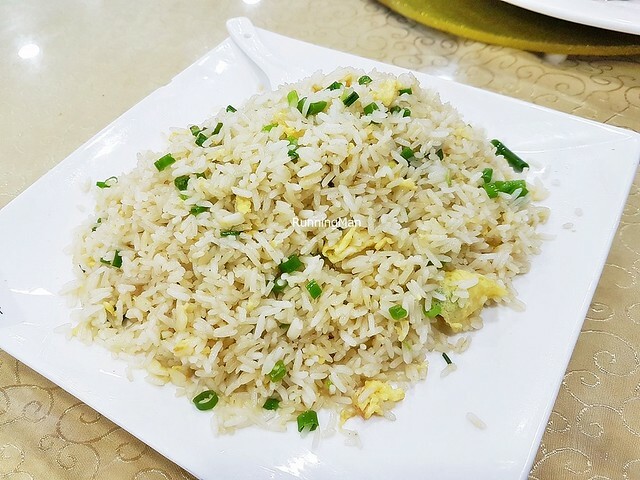 This is a very common vegetable dish served during most meals here. 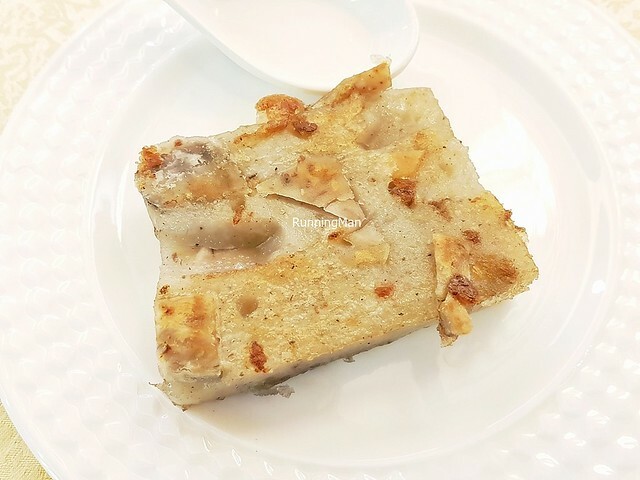 The Yam Taro Cake / Yu Tou Gao is made from mashed yam / taro, plain rice flour, dried shrimp, dried shiitake mushrooms, and dried Chinese pork sausage / lap cheong. 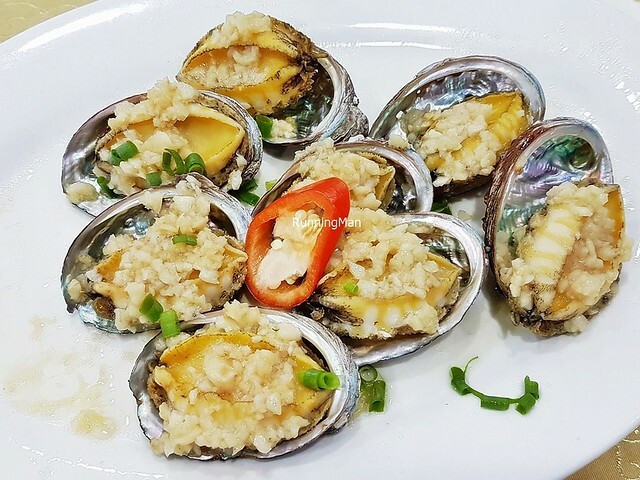 It's pan-fried till the exterior is crisp and golden-brown, but the interior remains soft and moist, with a bold savoury salty earthy flavour. 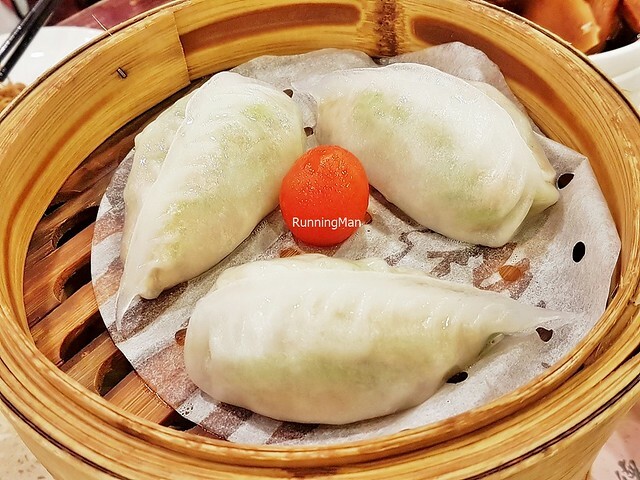 Usually served as part of a dim sum meal. 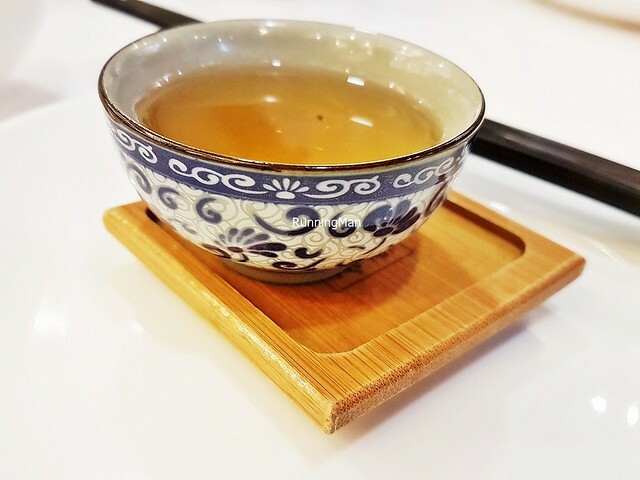 The Tea Jipu Chrysanthemum Pu-Erh is a blend of chrysanthemum tea and pu-erh tea, having a delicate earthy floral flavour.